Various configurations are available to cater for a range of mic arrays — shown here is an ‘MS Kit 4’ Mid‑Sides version, as evaluated for this review. Four years ago, Rycote launched their most advanced wind shielding system, the Cyclone, introducing some really innovative approaches to deliver a step-change in wind shielding performance, combined with delightful ease of use. The original models for mono shotgun mics (still the mainstay of TV and film location sound) have recently been joined by a comprehensive range of Stereo Cyclones, and I’ve been testing the MS4 kit with a Mid‑Sides stereo array of Sennheiser MKH30/40 microphones. The Cyclone features a pear-shaped outer shell, used with the ‘fat end’ facing forward. This minimises turbulence and maximises the capsule-to-shell distance, both helping to reduce wind noise. The shape also avoids flat and parallel surfaces around the mic, preventing internal reflections from causing coloration. Constructed in two pieces, the outer shell is split down the middle of the centre section with one end cap attached to each half, and embedded magnets secure these sections to the Cyclone’s ‘chassis’, allowing speedy removal and refitting. Previous generations of Rycote wind shield used a small-weave plastic mesh for the basic ‘zeppelin’ structure, lined on the inside with a breathable fabric and usually sporting a furry outer cover (a ‘Windjammer’). The Cyclone is built quite differently, with a much more open plastic frame and a specially developed multi-layered acoustic fabric bonded to the outside. Rycote call this new material ‘3D-Tex’ and it’s responsible for much of the improved technical performance. Windjammers tend to have a relatively short service life as the fur fibres break and shed, reducing the cover’s effectiveness, and the acoustic performance can be inconsistent either due to manufacturing variations or if the fur becomes wet or matted. In contrast, 3D-Tex is extremely consistent in manufacture, its wind noise-reducing performance and acoustic transparency are both considerably better than Windjammer-based systems. It also dries out very quickly if it gets wet and exhibits no matting or shedding! The asymmetric outer shell and 3D-Tex fabric aren’t the only innovations. Rycote discovered that some low-frequency handling noise actually comes from acoustic radiation off the wind shield basket. Consequently, the Cyclone’s outer shell is fully decoupled from the chassis via isolators at the top and bottom. An array of small Lyres connect the outer race track-shaped collars (to which the shell attaches magnetically) to the inner support structures connected directly to the standmount at the base of the Cyclone. Usefully, if the wind shield isn’t required (such as for indoor work), not only can the outer shell be taken off in seconds (literally), the C-arm supporting the upper suspension can also be removed by pressing on a lever, further reducing the size and weight of the entire system. 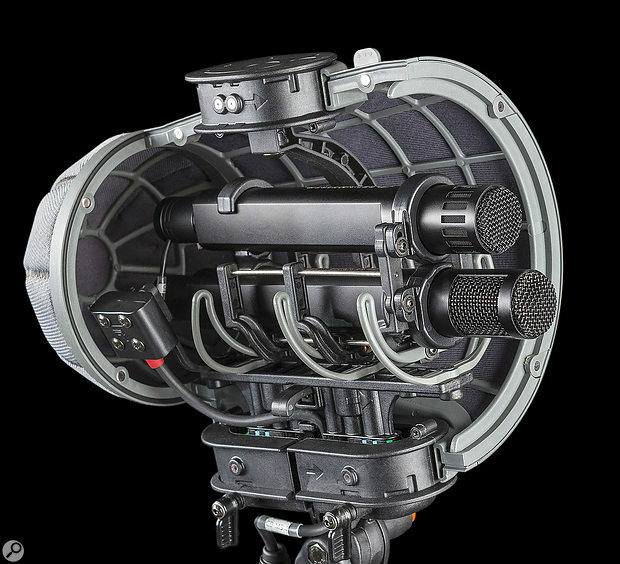 Rycote’s familiar Lyre suspensions also isolate the microphones from the internal mounting platform, each Lyre selected to provide the optimum compliance for the weight of the mic array. Over 30 different mic configurations can be accommodated in the new Stereo Cyclones, with options covering Mid‑Sides, X‑Y, single-body stereo mic, Double M‑S (surround) and Ambisonic arrangements. (For ORTF arrays a variant of the company’s Modular Windshield is recommended, as the basket is used sideways to accommodate the capsule spacing). The internal wiring provides short flexible XLR ‘tails’ for each mic, sprouting from a ‘Connbox’ attached to the rear of the mounting platform. A thicker multicore output cable from the Connbox routes through a clamp in the Cyclone’s base and out to an XLR plug that’s secured in an external bracket (five-pin for stereo arrays and seven-pin for Double M‑S). This arrangement prevents vibrations that travel along the mic cable getting into the mic, and a furry fabric effectively seals the cable entry slot to prevent air currents entering the wind shield. The specific rig I’ve been testing is identified as the ‘MS Kit 4’ using the small Cyclone shell that measures 267mm in length by 157mm diameter (at the fat end). Inside, three grey Lyres attached to the mounting platform support an inner frame with linked carriers shaped specifically for the flat-sided Sennheiser mics. As I started to install the mics I found that the lengths of the XLR tails are such that the MKH30 (Sides mic) can only be placed in the bottom carrier, and the MKH40 (Mid mic) in the upper carrier. This surprised me as I find the decoded M‑S stereo image is more stable when the Mid mic captures sound fractionally before the Sides mic and, when ‘booming’ from above the action (which is the typical application), that requires the Mid mic to be installed on the bottom of the array. When I put this to Timo Klinge, Rycote’s Chief Technology Officer, he explained that, as the fig‑8 mic in an M‑S array is always the most sensitive to wind noise, placing it at the bottom of the array ensures it sits exactly in the centre of the wind shield, maximising the distance to the outer shell and therefore the wind noise attenuation too — which makes a lot of sense! Impressively, with both mics installed the complete Cyclone rig weighs just 850 grams, and I was able to wave the wind shield around on the end of a long ‘fish-pole’ for extended periods quite comfortably. The installation is very neat and tidy, and there were no rattles at all in use, even with some aggressive movements. Handling noise was negligible, and the few LF rumbles that did make it through were almost entirely from the fig‑8 Sides mic — to be expected given the physics of the arrangement — but they were easily quelled with a high-pass filter on the Sides channel, which I consider ‘standard practice’ anyway. In use, the Cyclone really is in a different league to any wind shield system I’ve used previously; it’s no exaggeration to say I was gob-smacked at just how quiet it is, even in unpleasantly blustery conditions. And, since a Windjammer is rarely needed, no longer will some highly amusing member of the public interrupt me to ask why I have ‘a dead cat on a stick’, or if I could ‘just dust off the light fittings’. That benefit alone could easily justify the purchase price! Obviously, this is pretty specialist equipment and only relevant to those recording sound outside with studio-quality mics. But where the recording quality is paramount and wind noise completely unacceptable, there really is no better solution, either technically or in terms of practicality. The Cyclone sets a new benchmark — I am genuinely very impressed indeed. Prices range from £550.80 to £910.80, depending on the chosen configuration. Prices include VAT. Prices range from $699 to $749, according to the chosen configuration.